The special thing about a lunch special is that you supposedly get more bang for your buck, right? Specials usually come with a soup, salad, or taste of an appetizer. And sometimes even with a dessert afterwards. I’ve eaten at P.F. Chang’s before, but have never ordered off their lunch specials menu. After lunch last week, I learned that P.F. Chang’s lunch specials leave a lot to be desired, at least portion-wise. Given a choice of soup or salad, I went with the former and ordered a cup of Egg Drop Soup. The soup was all right, a bit saltier than I was expecting — egg drop soup is usually pretty bland — but still decent, okay-fine. Noodles, sushi, and meats. How could a menu get any more complete than that?! A frolleague of mine recently introduced me to an Asian restaurant she stumbled upon in a suburb of Miami. 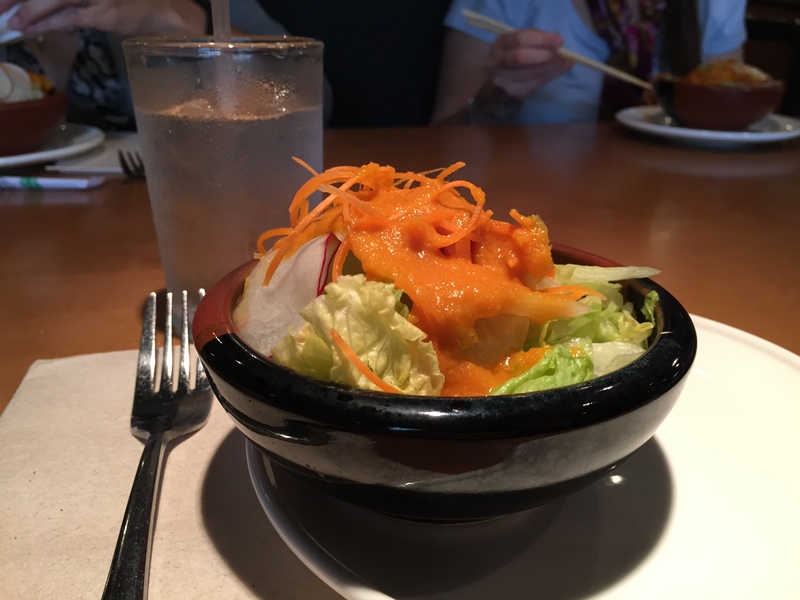 Green Plate Asian Bistro* in Doral opened in July 2014 and claims to be “a combination of authentic Chinese, Thai, and Japanese culinary culture with a modern twist.” Given my inclination towards fusion cuisine, I didn’t hesitate to give it a go. Feeling healthy, I started off with a house salad with ginger dressing. Standard fare, nothing special there — but not that I was expecting anything extraordinary. I’d give it an okay.